Do you work at Equator Bar? What did you think of Equator Bar? Being a straight male i did have some reservations about going to equator but i was pleasantly suprised how nice this bar is and how friendly the crowds are. I have since come back here many times and always have a good time. Equator quite clearly is a place to be visited when you’re on Hurst Street. It’s stylish, always carries a friendly, cool , relaxed and fun vibe rolled into one. If you want a place where you can chat to others (friends or strangers!) or just sit and enjoy your own company then get yourself here! The food is second to none, the beer is excellent, they serve fine reds and on top you get excellent service from the staff in a clean and stylish environment. Whether you go to an organised party, to dance to the DJ’s tunes on a weekend or for a chilled afternoon beer / coffee, you’re pretty much guaranteed that if you pop into Equator for one… you’ll be staying for another! And then you’ll be back again….. 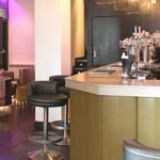 I love Equator Bar we always start our evening here and will pop in during the day at the weekends for a nice breakfast and a catch up! We are having our engagement party here next week and are really looking forward to this as we know that they will make it an unmistakeable evening!! 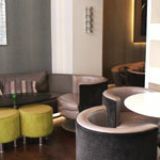 Lovely bar with a great atmosphere, perfect for a laid-back catch-up with friends. Always looks stunning too. Had a brilliant birthday party in there last year. It was a perfect venue... great staff, music and food. Recommended. I have been visiting Equator Bar for years now, they are by far the Best Bar on the gay scene. Their staff are always helpful and happy to please. If your in need of a good breakfast on a Saturday pop into Equator after 12 noon - their breakfast is by far the best tummy filler I have ever had and the rest of the menu is excellent. Another good thing to report here is that the toilets are always clean, smelling fresh and well stocked with loo roll ! Well Done Equator Team... keep up the Good Work !! With its slightly 70s throwback feel Equator is so cool it's hot. Equator is a medium sized, modern style gay bar which is all metals, beiges, off-whites and colourful swooshes. The walls are a white canvas, apart from sections covered in grey and lime green funkily patterned wallpaper. 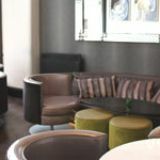 Four glossy, dark leather settees are dotted with lime green cushions which face low tables. Sink into these and it's likely you'll be there for the day. 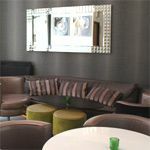 Further into the room a very high-backed banquette sits opposite the small bar, which is on the right and has beige and brown panels on the wall behind it, as well as small coloured spotlights shining down from overhead. 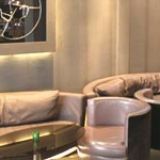 There are small cocktail tables and bucket armchairs with stub metal legs, as well as exposed tubing in the high dark ceiling and modern art on the walls alongside illuminated panels and lamps. A fairly smart set comes here to sip cocktails and catch up. It’s more of a laidback bunch so if you want loud house music and flashing lights there are plenty of other places to go. Equator is more a place to spend a few hours over lunch, drink a few beers and plan your night ahead, or talk about the one before. It also has good deals so although you're drinking in style you don't feel like you're paying for it. You’ve got Carling, Guinness, Strongbow, Beck’s, Stella, Staropramen and Boddington’s (which costs £2.50 a pint till 7pm in the week) all on draught. In bottles you’ve got Peroni, Magner’s, Budweiser, Beck’s and Corona. A bottle of house wine is a tenner and on the food menu there are baguettes, jacket potatoes, breakfasts and paninis. And giant Yorkshire puddings filled with bangers and gravy for £4.50. Equator is modestly modern with retro touches and has a chilled atmosphere that's perfect for a lazy Sunday.